The Ram ProMaster City offers the best conceivable power for a vehicle in its class, with a payload and towing capacity that is more than enough. 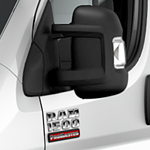 The popular cargo van has a wide range of multi-purpose options to use for your business. The 2.4-liter four-cylinder Tigershark MultiAir 2 engine provides best-in-class horsepower of 178. The engine is the largest and most powerful of all four-cylinder engines combined in the Ram lineup. The powertrain is supported by a nine-speed automatic transmission that is equipped with Electronic Range Select, which uses an electromechanical gear selection system to provide improved control ability. The power of the van is important because it has a payload capacity of 1,885 pounds and a towing capacity of 2,000 pounds. Additionally, the roof has a maximum weight load of 150 pounds. Stop by our dealership to learn more about the 2018 Ram ProMaster City and take a test drive!